This is the latest Spring 2018 edition. A Bait Boat First, now on 5.8ghz Digital means your even much less likely to suffer from interference from other Bait Boats on the same water. This most recent boat now also displays the boats battery power on the screen on your boat remote. The boat aerial is now even shorter around four inches long. Neither will they come with the accessories ours do. NOT TO MENTION THE GREAT BACK UP SERVICE WE OFFER! 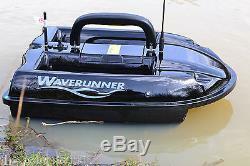 This is the Award Winning Bait Boat from Waverunner Bait Boats! (handset now looks different from the one pictured above). Packed full of great features and looks the part too. In this offer you will receive. 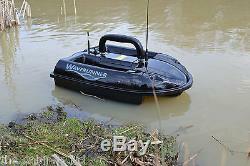 Latest Waverunner MK4 Bait Boat on 5.8ghz + Latest Toslon TF640 fish finder / GPS also on Digital. The same boat as the older MK3 however the radio gear is improved as its on 5.8ghz (Digital) meaning your. Much less likely to get interference from other Bait Boats on the same water. Also the boat aerial is now very short (around 6 inches). Twin independent hoppers with patented hopper release system. Excellent for all baits including particles. Twin independent rig holders with patented hook release system. Stainless steel weed guards are fitted to the Waverunner Baitboats. 10 ultra high intensity LED's. All lights can be operated form the hand set. Range 500 to 1000m depending upon weather conditions. 2hrs+ Running time at max speed on a single battery. 4kg bait capacity in total. The Very Clever Toslon TF640 Fish/Feature Finder & GPS in one! New For Summer 2015 and Exclusive to us here at The Cabin the newer and much improved TF640 Bait Boat Colour Fish/Feature Finder and combined GPS on 2.4ghz Digital. 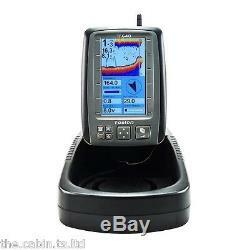 Price includes fitting and Lake Testing on your Bait Boat. Colour doesn't necessarily mean more detail than black models however, on this unit there has been many improvements which doe's include much more detail. The best feature would be the world's first wireless bait boat fish finder for the frequency to be on 2.4ghz (Digital) which means unlike most other fish finders which work on the same 433. Mhz frequency and signal clashing can be common on busy waters, this TF640 is now on Digital, which means in most cases it will eliminate any other signals from bait boats on the same water. Also with one of the largest LED lit display screens available you should have no problem in viewing the structure, features and fish from underneath your boat. We have found though, if you keep the fish I. D setting turned off, your more likely to see more structures like weed and snags etc.. A much improved wireless range also which now boasts 300+ metres. As you can see the depth reading is now accurate to under 12 inch's of water. GPS data display show: Distance to target, Distance to Home (Your Swim) Speed of boat, Time to Board, Satellite Number, Heading, Bear, Course Memory, Time of day, Main Battery Voltage. Compass indicator of the instant boat heading direction on screen (a red "+" on screen indicate the target). Indicator of the position and distance to target waypoint and HOME. Indication of satellite condition by colour bar: red(0satellites); Yellow(36); Blue? Show the current position as latitude/longitude in decimal degrees. 20 RF channels allow different users operation at same region without interference. Detailed waypoint information including icon, name, date, etc. Display size: 4.3TFT LCD; Sunlight Viewable. Resolution: 480272Pixels; 65,536 color. Monitor and Display Real-time Voltage of Bait boat Battery. IPX6 Level Waterproof Casing Design. Sonar Alarms: Fish / Shallow / Low Battery. RC Distance 300m plus (1000ft). Wireless Radio Frequency: 2.4Ghz, Digital. Power of Display: 612V lithium/lead acid battery or 8 x AA Batteries. 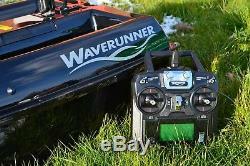 Power of Transmitter: Powered by bait boat battery or DC612V/2.0W. Sonar unit size: 153 x110 x 44mm; Portable Case Size: 262 x 150 x 98mm. Extreme stable wireless performance even in bad conditions. Display target depth reading above each fish symbol. Big / small fish identification. Rugged portable case for a full protection of the fish finder. The below picture this Toslon is being tested on a very clear but weedy water. The weed is very thick and dense however the unit is picking up signal from the top of thick weed to the surface of the lake. This is great for working out how far weed is from the lake bed. It's advised that on most fish/feature finders you keep the fish I. D setting turned off as this should then show you more bottom structure however, if your after finding those sneaky fish, as shown on picture below the fish symbol should appear and the number displayed above them is the depth of the fish from the surface. Base units requires 8 x AA Batteries (DURACELL Recommended). Sonar/device in boat power supply choice of 9v PP3 or mini 12v lead acid battery (preferred). All you need is a long bank stick to attach to the base unit of the screen which then makes it hands free! (Advised if using over 200 yards). The higher your sounder the better signal strength you'll receive. Comes complete with bag and in a box. Please note it may take up to 48 hours to fit and lake test this package before it leaves our store. Unlike any other company, all items will be fully lake tested and set up correctly first to make sure it reaches you in. Perfect working order and ready to use. We will however help you to find which batteries you require by sending you a link. The item "Waverunner MK4 Bait Boat + Toslon TF640 Echo & GPS" is in sale since Wednesday, October 14, 2015. 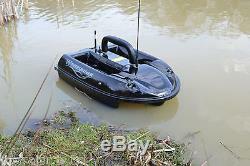 This item is in the category "Sporting Goods\Fishing\Anglers' Equipment\Bait Boats".ltd" and is located in Yelverton. This item can be shipped worldwide.